LP360 has several very useful command line executable utilities that can be used to simplify different tasks or improve the efficiency of large batch processes when working with substantial amounts of data or repeating processes. LDExport was added to this utility catalog with 2017.1. It simplifies the export of LAS points and surfaces, for example when generating output products. LDExport can be found along with the other command line utilities at C:\\Program Files\Common Files\QCoherent (or Program Files (x86) for 32-bit installs. LDExport can be run as needed by executing it as manual command line call from the source folder. More typically, you will want to integrate it into a GeoCue checklist step or your own MS-DOS style batch script for convenience. 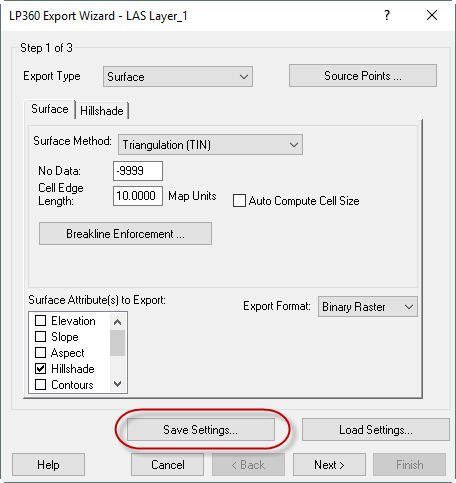 Prior to running LDExport you will want to use LP360’s Export Wizard to configure your output settings and then save these settings (they are saved as an XML file). This allows you to determine your output type and any relevant settings. You should also test the output settings first on sample data to make sure you will get the results you expect. Once you have your desired export settings saved, there are several useful command line parameters to tweak the LDExport process. First, the command takes a standard -f, -i or -d parameter to indicate the input file location. The output location is specified with the standard -o parameter. Next the -s parameter sets the pointer to the XML file with the settings you saved above. You can use -sidx to identify an index shape file (.shp). You can choose to have LDExport process files individually with the -n parameter, otherwise all files will process together as a group. Typically, you will want to process as a group for surface generation and individually for point outputs. 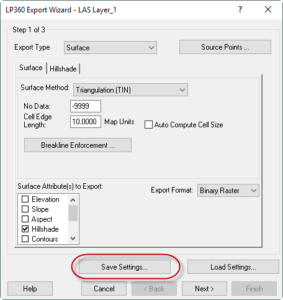 To further allow you to tweak the process, you can control the extent of the output area if you do not need to use an entire data set. For example, extracting a county DEM from a statewide data set. To implement this, LDExport supports a designated area of interest (AOI) mask via the -g parameter. Use -g to point to a shape file (.shp) that contains one (or more) AOI geometries as polygons. The export will be limited to the interiors of the AOIs. Use the -d parameter as a follow-on to -g to specify the field in the .shp file to use in the output file names. Finally, you can get a summary of all parameters via the -h or -? parameters. LDExport definitely helps simplify and streamline creating products or outputting points and surfaces from you LAS data sets. This entry was posted in LP360 Tools, Tips and Workflows and tagged command line executable, LP360, utility.